Production has stalled in Korea's Kaesong Industrial Complex. At least in the short-term, renewed confrontation & militarism is bad for business. The BBC quotes the following figures on the 10-year old Kaesong Industrial Complex collaboration: 123 firms and 53,448 North Korean workers producing US$470m worth of goods in 2012; "the biggest contributor to inter-Korean trade." Unwilling to fall quick victim to frictions, South Korean industry is surely pressuring their government and new President Park Geun-hye. President Park had pledged a renewed firmness in relations, to be "more decisive" - and now two months in office, she's successfully made her mark. The Washington Post notes President Park's pledge to concentrate on denuclearization. But they don't explain enough. Making (DPRK unilateral) denuclearization prerequisite to progress may be bluntly saying nothing will be done. The paradox is that doing nothing is not an option; South Korea's hurry-hurry (빨리빨리) society expects growth & progress - not stagnation or backwards steps. To fully analyze this complex set of issues is sensitive & risky, and sniping from the sidelines is easier than sitting in the hot seat. Confrontation with North Korea is very costly and dangerous. Throughout Park's first 60 days in office, repeated frightening threats have been exchanged over divided Korea. External perceptions of Korea's attractiveness for investment, as a hub for regional business, and as a fully reliable business partner have suffered. Seoul will lose the war of words, because Seoul & Pyongyang are too close for comfort. Seoul must compete with other regional locations outside Pyongyang's quick reach. North Korea is often cited as being strongly nationalistic and chauvinistic, with its juche ideology of self-reliance, but South Korea also can be dangerously xenophobic. As regards attitude of population to foreign visitors, the World Economic Forum asked "How welcome are foreign visitors in your country?" - South Korea ranks 129th of 140 nations, just behind Saudi Arabia (Travel & Tourism Competitiveness Report 2013, Data Table 12.02). Arbitrary bureaucratic interference adds risk, and the Lone Star fiasco (link) displayed South Korea's resentment to foreign investment. Notwithstanding many positive steps and huge progress, Korea still has many risky shortcomings. Many people around the world, myself included, deeply & sincerely wish President Park's government great success. But she's a polarizing figure, and her mandate is narrow. 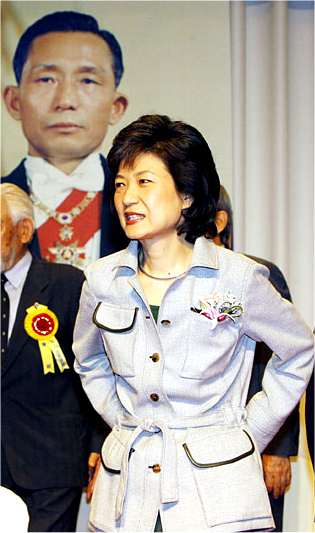 Her father's authoritarian rule was firmly backed by the USA, which still bases 28,000+ troops throughout South Korea. Park has a good working relationship with America. But the appearance of more Yankee influence could easily alarm & ignite dangerous nationalism, with tragic blowback. Is Boston Bomber in Custody?